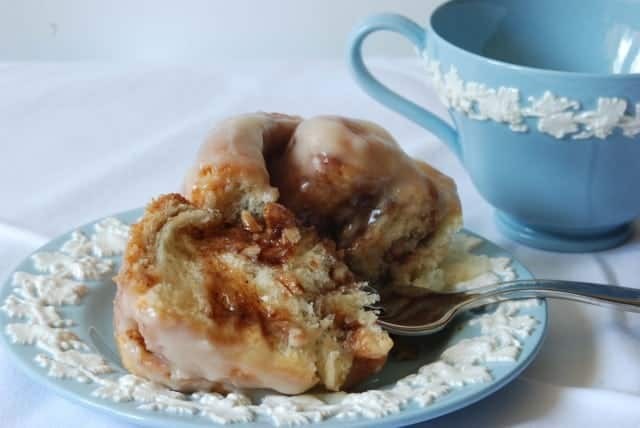 My Best Cinnamon Rolls are traditional cinnamon rolls with cream cheese icing. 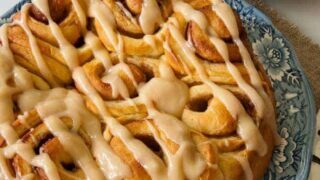 This recipe incorporates a secret ingredient that will remind you of pecan twirls. Written for mixing and kneading in a bread machine, but you can also use a stand mixer or do it by hand. See the recipe notes. 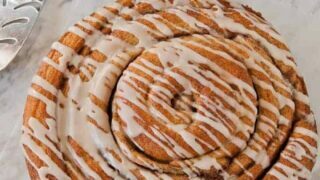 Do you remember the pecan twirls we used to have for breakfast sometimes as kids? I think I figured it out. Read on to find out how I incorporated the tiniest bit of ground cloves into my cinnamon rolls. These are actually a variation on the dinner rolls I posted a few days ago. I ALWAYS make them in my bread machine but NEVER bake in it. That would be pretty hard to do with cinnamon rolls anyway. After the dough has risen, remove from the bread pan, punch down gently and divide dough in half. On a generously floured surface, roll each half into a rectangle size. Spread each rectangle with approximately 2 tablespoons of softened or melted butter, then the filling, then chopped nuts, if using. 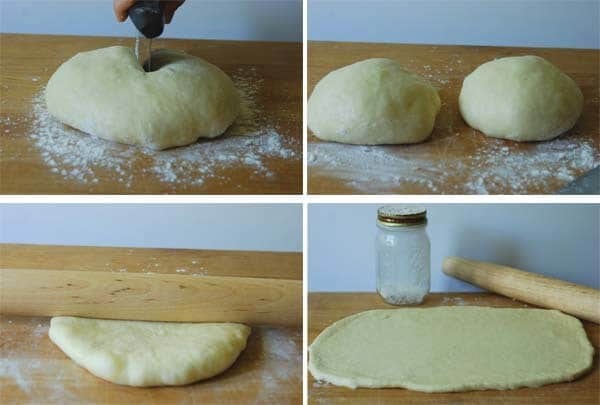 Roll up dough the long way. Slice into 8 equal pieces. Place cut side down in greased 8 or 9-inch pan or glass dish. Best eaten the day they are baked. However, they can be frozen and are pretty tasty when zapped very briefly in the microwave and eaten immediately. It’s a homemade flour shaker–or at least that’s what I call it. The next time you have an empty glass left over with a secure lid, poke holes in the top. I used an awl (think that’s what it’s called– Tim the tool man I’m not.) This is more than handy whenever you make bread, pie crusts or rolled cookies. These cinnamon rolls are so soft, flaky, buttery, and ooey-gooey, they probably won't last more than one day. But if you have leftovers, you'll be surprised how yummy they are. 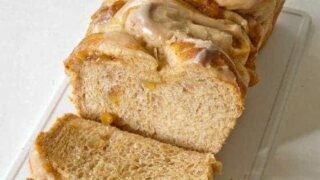 Twisted Cinnamon-Pecan Breakfast Yeast Bread is a yeast bread in the same family as cinnamon rolls--directions for mixing and kneading in a bread machine included. 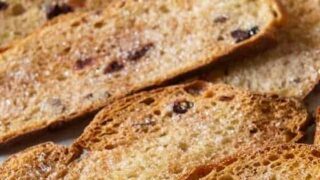 In taste and appearance, these resemble the cinnamon toast crisps sold at the Corner Bakery. 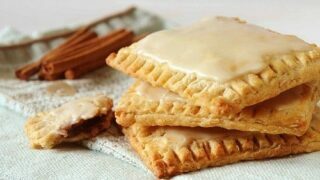 Although a little extra effort is involved, these pop-tarts are a special treat for a memorable breakfast. 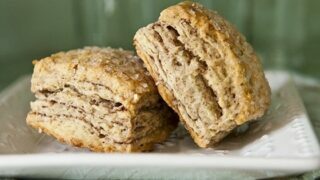 Light and flaky cinnamon-laced layers set these biscuits apart from the average. Substitute buttermilk if you don't have whey. 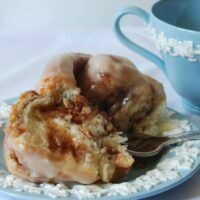 My Best Cinnamon Rolls are traditional cinnamon rolls with cream cheese --includes a secret ingredient. Written for mixing in a bread machine. Pinch of cloves (the secret ingredient). After the dough has risen, remove from the bread pan, punch down gently and divide dough in half. 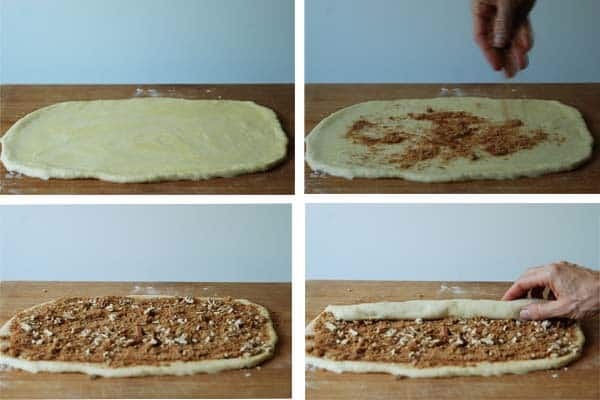 On a generously floured surface, roll each half into a rectangle size. The bigger the better--gives more surface to layer the good stuff, like butter, sugar, and cinnamon. Don't roll it too thin, however, or it will tear and cause you all kinds of frustration. Spread each rectangle with approximately 2 tablespoons of softened or melted butter. Mix brown sugar, cinnamon, and cloves. Distribute half of this mixture over first rectangle and half over the second. Sprinkle about 1/4 c. chopped, toasted, pecans over the brown sugar-cinnamon layer. Cover and let rise till double in a warm, moist place. Preheat oven to 375 degrees. Bake rolls for about 20 minutes or until golden brown. Ice with 2 cups powdered sugar mixed with 1/4 cup cream cheese and 2 tablespoons coffee. May need more or less coffee depending on how thick you like your icing. Milk will substitute for coffee. Can I sub the butter with oil? Thanks. It’s too long of a story but I have a special bread maker which belonged to a now-deceased friend of my mother’s. I am 61 and my mother passed away in 1985, her friend in 2004. I use her bread machine sparingly to preserve it and found your website while looking up a question on Yogurt starter and have spent several hours glued to your site. This is the last recipe for tonight but tomorrow I will pull it out and make one of your bread recipes, maybe cinnamon rolls in her honor, maybe the dinner rolls which would have been my mom’s favorite. Either way, thanks for an enjoyable evening. Even Santa was happy with the Salad in a Jar idea. Thanks. I have now bookmarked your site so I can remember where I found all these fabulous recipes. Do you leave the flour in it? If so, how do you keep from getting moisture in it? I love your recipes-you inspired me to get my first bread maker! Used the dough cycle for first time today…bread is rising now so we shall see! Hi, newbie here. 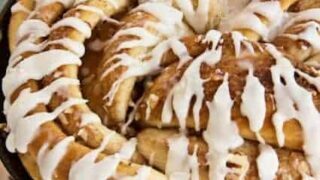 Came across your recipe and I made the cinammon rolls last night and it was yummy when hot. However, the base will tend to burn before the roll is done… how do I avoid that? WOW, WOW, WOW… my family just loved these! Made the sweet milk white bread so I knew I could not go wrong trying another recipe 🙂 I was SO right! Amazing! I think my bucket list shall include making all recipes from “Salad-In-A-Jar”. Thanks again! From the newest Happy Baker! So this recipe makes 16 rolls essentially right? Can I cut it in half to just make 8? I don’t need that many. And that flour shaker?! Genius!!!!!! 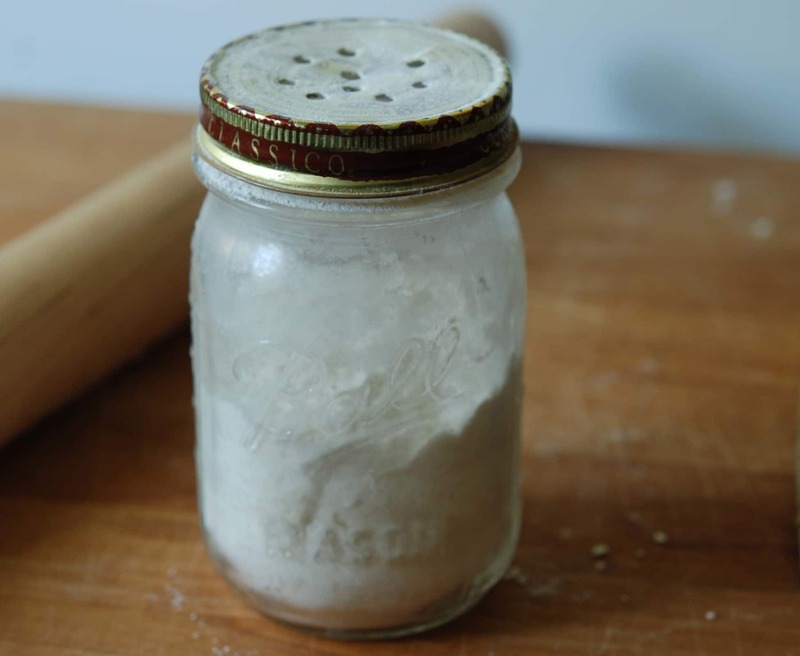 Instead of poking holes in a jar, I rinse and dry an empty Parmesan cheese container & fill it with flour. Love your blog! Good idea, Sunshine. Haven’t bought canned Parm in years but great way to recycle. Thanks for posting pictures. They do help a lot . Your variation sounds absolutely wonderful! Thanks for sharing. Just made the Cinnamon Rolls, so delish! I will share some with the neighbors, can’t leave these out, too tempting. I like the coffee in the icing, cuts down on the sweetness of the sugar. My husband ate two while I was in exercise class this morning and they were not iced yet. Delicious without icing also. Thanks for the great recipe. I stumbled upon your website on Pinterest! It has been years since I have had cinnamon rolls! This is the first time I have made dough with my breadmaker though. I usually bake a loaf of bread, unlike you. I live in Australia and the flour isn’t as forgiving here. My loaves have come out fairly solid (unlike the Canadian flour) I have since discovered a Bread Improver that is safe to use. It is getting towards summer here and the house is a nice warm temperature so I thought of giving it a go (during my exercise course, LOL!) I noticed that Butter isn’t added to your Filler, but is mentioned as something to do. 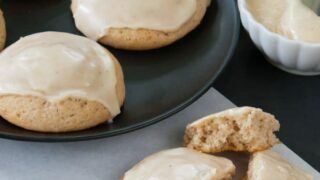 I used 1/4 C butter and 1/4 cup white sugar, at least 2 cups of brown sugar, and probably close to 3TBSP cinnamon (like I remember my Mom doing). I sprinkled at least 1 1/2 cups of sultanas on the baking paper and placing my 24 rolls on that( I rolled really thin as my Mom used to do). So very yummy! Your rolls sound delicious! Thanks for the heads-up about the butter. Enjoy that warm weather. I would like to know if I can freeze the rolls unbaked. If yes, can i put them on the oven straight from the freezer? Yes, you can freeze them unbaked but I don’t think they are quite as good. However, you must let them thaw and rise before baking which can take up to a couple hours depending on the ambient temperature. I prefer to bake the rolls, then freeze. If you want to make rolls the day before and bake the next morning, I recommend the “Super Convenient Potato Cheese Rolls” without the cheese of course. 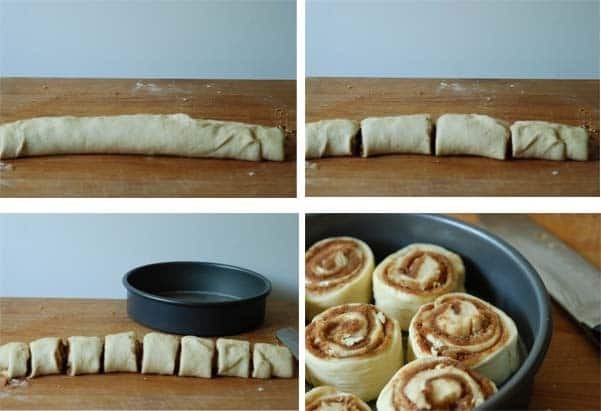 Make the dough and roll out like cinnamon rolls, cover and refrigerate. In the morning, it won’t take as long to warm up and rise compared to frozen dough. Something about potatoes in the dough gives them more staying power and I think you will find them equally delicious. oh and if i leave it in the bread machine till the very end, when i take it out do i let it rise again or go straight to the oven? *sigh* this is confusing. I am extremely new to making bread and am going to also use my bread machine that a friend gave me to make dough and then bake in the oven. I found a recipe i want to try for sweet white bread that supposedly is really good like hawaiian bread. My questions are, my bread maker apparently beeps once after kneading and then 8 times after it is completely done in bread maker i guess after it has risen. When do i take the dough out? Also, u say let dough rise in a warm, moist place. My thermostat is usually always on 75-77 and where do i set it to rise? i also have a small portable heater in my bathroom if need be (although that sounds kinda weird to put bread dough in the bathroom lol). I just have no idea what i’m doing so some direction would be great. Thanks! Can you make these the night before up to the point before the last rise and then refrigerate them? I love them – but do not love getting up at the crack of dawn to have them ready for my little ones. this recipe looks very good, can’t wait to make them, thanks! I’m going to try to make your cinnamon rolls, but the recipe for the filling doesn’t seem to have enough cinnamon (2 tsp). Should the amount be 2 tbsp or am I missing something? Thanks for stopping by louboo. Pizza is a great place to start with a bread machine. Love your site. Great pictures as well! I LOVE your site and enjoyed reading about you and your fresh salad ideas and this flour shaker! How awesome is that??? I would love to have one too, so the next time I have a jar with a nice lid, I will ask my husband to make me one too! I just found your blog through Pioneer Woman, and I love it! I love your homemade flour shaker. It’s on my “Honey-Do List”! Thanks for stopping by Kathy. Are you a baker? If so, you are going to enjoy your shaker–and probably use less flour in the process. Less mess and better product.